Wolverhampton prides itself on being a cohesive community, with there being very few issues reported. The city has not seen protests by extremist groups in the same way that neighbouring authorities have, in part due to the community being accepting of difference, and not giving extremist groups an inlet for protest. Where specific issues do occur SWP provide a coordinated response utilising the combined resources of multiple agencies. SWP has a robust approach to monitoring community tensions across the city. Each month councillors and community leaders across Wolverhampton are asked to provide details of tensions that they are aware of. Tension reports are actioned by the relevant council or police department, with the individual who submitted the report being kept informed throughout. The city also has a dedicated Community Cohesion Forum, formed of statutory agencies, community groups and organisations, councillors and the faith sector. The Forum works to identify community concerns, and allows statutory partners the opportunity to ask the community for their assistance and input in upcoming work. If your organisation is interested in becoming part of the Community Cohesion Forum, please contact us for more details. Hate crime can be reported via the hate crime reporting centres or directly to the Police. The Police will collate information received to understand if there are pockets of concern that require specific targeted work to ensure ongoing community cohesion across Wolverhampton. Despite Wolverhampton having over 250 faith-based organisations within the city, there was not one key agreement in place for the statutory sector to liaise and engage with them. Following a suggestion from the Diocese of Lichfield’s interfaith officer, a working group examined the All-Party Parliamentary Group on Faith and Society’s Faith Covenant, and began work to make it into the Wolverhampton Faith Covenant. The working group included faith representatives, representation from the voluntary sector and public-sector bodies. The Covenant was formally launched on the 12th December 2017. It will be used as a vehicle for further Faith engagement within the city. 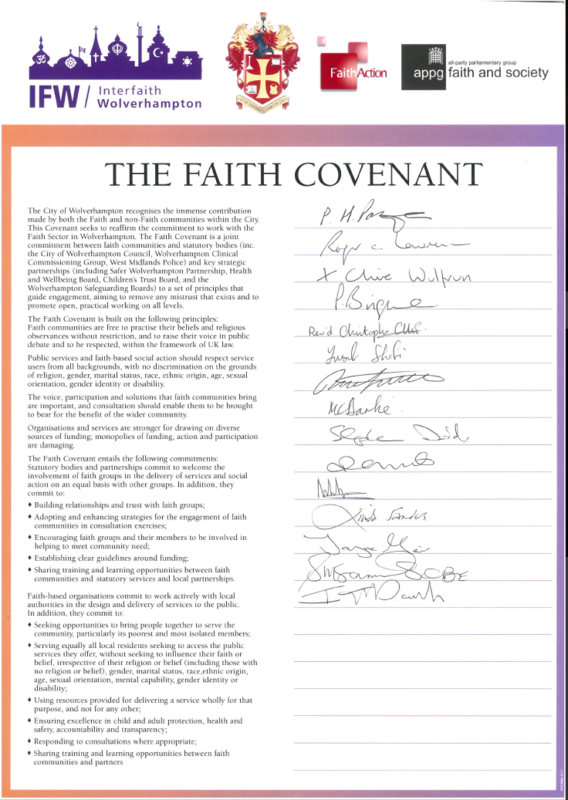 If any organisation or community is interested in signing the Covenant, please contact SWP.